We physically feel anger. When an event triggers this extreme emotion, there is a rush of adrenalin, our hearts pump, and blood rushes to our head. These physical symptoms can quickly turn into impulsive actions and poor decision-making. Separations and divorces present countless opportunities for anger to rear its head. This will manifest as angry words, petty actions, threats, harassment, and violence. 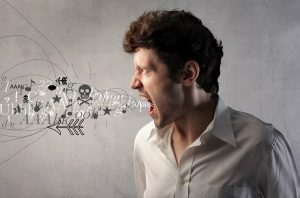 This is why it is incredibly important for us to understand our own anger, what brings about our anger, and how we live in that anger without acting in a destructive manner. Be mindful of the potential consequences of your anger. This includes the end of relationships, losing your job, going to jail, or physically harming somebody. For legal purposes, if your anger manifests as harassment or domestic violence, you can lose custody of your children and a court can restrict your ability to visit them. Further, courts take anger and volatility very seriously when entering alimony and child custody orders. The goal of managing anger is not to ignore or avoid your feelings. Instead, it is important to be aware of the symptoms of your anger. These may be tense muscles, blood rushing to your face, strange sweating, clenched fists, or a rapid increase in your heart rate. When you recognize that your body is exhibiting physical symptoms of anger, immediately remove yourself from the situation. This means hang up the phone, walk away from the computer, or physically leave the room you are in. Then take steps to change your heart rate. This may include deep breaths, taking a short walk, or even going to the gym. Identify why you became angry. There is a good chance that you have a smartphone on you. Use it to take notes about the event that made you angry. If you review these notes over time, you may spot themes or subject matters that trigger you. These are some simple, immediate ideas that you can consider implementing; however, we recognize that anger is complex and deeply rooted. Therefore, if your anger is a recurring problem in your life, we advise that you seek help. It can be incredibly beneficial to speak with a professional counselor or to attend a support group. If you keep notes, you can work with a professional to identify what makes you angry, why you become angry, and how to feel that anger without lashing out. New Direction Family Law has represented clients in all areas of family law, including child custody, separation, and divorce. Our team has two decades of legal experience in advocating for clients in their darkest hour. We have also devoted time to building relationships with great therapist that we trust to take great care of you. If you need a family lawyer or therapist referral, give us a call. We serve Wake, Johnston, Lee, Harnett, Cumberland, Nash, Granville, Franklin, and Durham counties. Call our team today at (919) 719-3470 for an initial consultation, or visit us online at our website.